In my efforts to (1) make the most of our Netflix subscription and (2) find things to watch that Tobie may not necessarily watch, I ended up exploring the odd, often depressing world of BoJack Horseman. It didn't feel like a show that I'd get into at first based on the initial episodes but then things just sort of worked out. It's important to note that this is not a typical comedy and it's definitely not a run-of-the-mill cartoon. If anything, it's a serious comedy drama piece that just happens to be animated. It's quite adult in tone but not always in a shallow, low brow humor sort of vein. And the subtle integrity of the show is really what helped save it and kept me on board. By the time I'm writing this review, I'm pretty committed to the show. It's definitely not something I'd easily recommend to other people but it is a show that I've come to enjoy during my late nights of blogging and messing around the internet. It's a show with a lot to say and a deliberately messy way of delivering that message such that it remains comedic but then again it's really not just that. 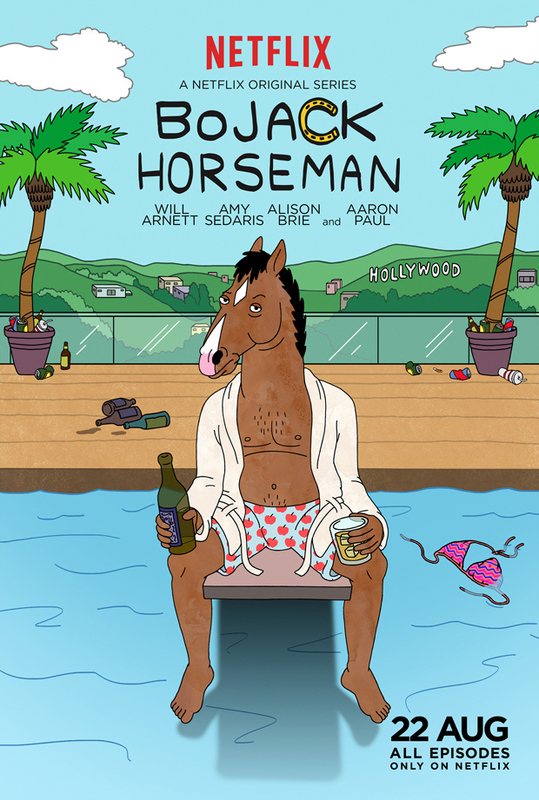 Synopsis: BoJack Horseman is an adult-oriented animated comedy series created by Raphael Bob-Waksberg for Netflix. The show currently spans four seasons as of the time this blog post was written. BoJack Horseman (Will Arnett) is washed out actor in his 50's who hit it big with a show called Horsin' Around back in the 90's but nothing much since then. In this world of anthropomorphic animals, BoJack is now a jaded, self-loathing, alcoholic horse with only Todd Chavez (Aaron Paul) as a companion, although the circumstances that brought Todd to BoJack's life seem pretty random. He continues to deal with Princess Carolyn (Amy Sedaris) his agent and one-time fling as she struggles to find him work. Eventually BoJack decides to write a memoir and hires Diane (Alison Brie) as his ghostwriter. As he goes through the process of telling the story of his life, he also develops deeper feelings for her. But then she's already in a relationship with Mr. Peanutbutter (Paul F. Tompkins), BoJack's canine former sitcom rival. During this season he's also filming a reality show of his life. What I Liked: There's a subtle brilliance to the show that isn't all that evident in the first half of this season. But things really start to come together in the second half when the show really finds its voice and the characters feel less one-dimensional. It takes a while to get to this point but the show does get there and that starts to pay off more in latest seasons. It's also kind of insane the sort of voice talent the show pulls together. The primary cast include a lot of Saturday Night Live veterans and as things progress other notable names join the crew. And let's face it, Will Arnett has an amazing speaking voice that makes for a brilliant character voice and quite pleasant to listen to. It helps you get past the fact that his character is mostly horrible in this season and it's hard to find his redeeming values given how damaged he is. What Could Have Been Better: For a better part of the season it feels like BoJack is mean and crazy for no real reason. He does fit our model of the stereotypical celebrity of who gets famous for one thing and never lets go of the power of that one thing. But that initially made him feel more like a caricature than an actual character. And the people around him are often similarly strange, but BoJack just seems to be meaner in his way of things. I wish they had started to deepen character development earlier than they did. The show benefits from being a Netflix binge-watching experience but not everyone is willing to dive deep into a show on the first go. The first 3 or so episodes aren't all that strong and I can understand how some people can choose to quit the show at that point. The promise of better things in later seasons isn't enough to justify the initial pacing and direction for the show. TL;DR: BoJack Horsemani is a tough show to love but if you want to see something very real that just happens to be animated in form, you're going to get it here. It's a heavier show than it seems and I wouldn't sell it as a simple comedy since it's totally not that. Thus the first season gets 3 moments of BoJack being self-destructive out of a possible 5.